A festive winter grapefruit avocado salad with peppery arugula, hearts of palm, candied pecans, dried cranberries and a maple apple cider vinegar dressing. 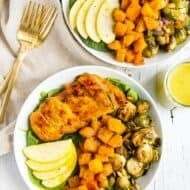 Recipe made in partnership with Winter Sweetz Grapefruit. One of my favorites thing about winter, besides the holidays, is the fact that citrus fruits are in season. I’m a fan of pretty much all citrus fruits, but there’s nothing quite like a perfectly ripe grapefruit. It’s just so sweet, flavorful and refreshing. Grapefruit has amazing health benefits, too. It’s loaded with vitamin C, which strengthens the immune system, and the antioxidant lycopene, which is shown to reduce inflammation and prevent cell damage. 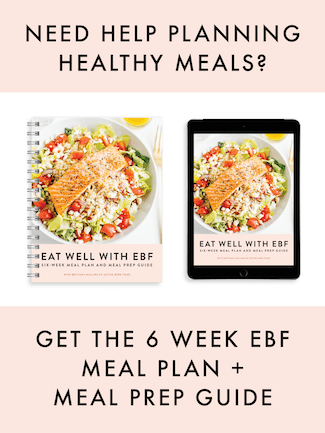 It can also help with weight loss because it’s a great source of fiber, has a high water content (which helps with hydration and satiety) and it’s low in calories. A lot of folks tend to think of grapefruit as being tart or bitter, but in actuality ripe grapefruit is really sweet, it’s the pith (or white part) that’s bitter. And if you segment the fruit, you’re able to remove the pith and enjoy the sweet flesh of the fruit on its own. To be honest, I just learned how to segment grapefruit this year and it’s a total game changer! I could give you a tutorial, but this short video does a better job explaining it than I ever could so be sure to check it out. Once you have the grapefruit segmented you can use it in a variety of recipes, from cocktails to baked goods to salads and more. The peak season for grapefruit is November – March so you should be able to find the sweetest grapefruit during these months. Although, keep in mind that some varieties are sweeter than others. Those grown in Texas, like the Winter Sweetz, are grown in rich soil and a temperate climate so they have a uniquely sweet, delicious flavor. When choosing your grapefruit at the store look for grapefruits with red blushed skin that feel heavy for their size. Heavy fruit means lots of juice! Adding grapefruit to salad is one of my favorite ways to enjoy it — especially paired with creamy avocado. 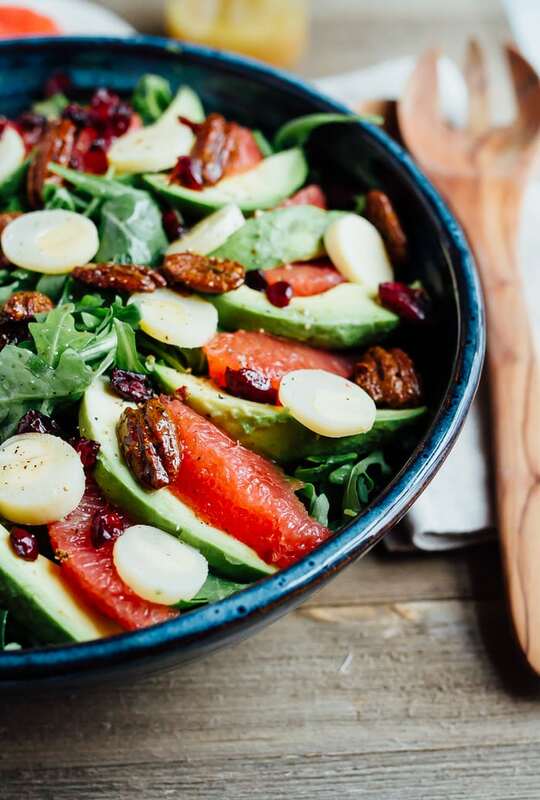 The avocado grapefruit combo is awesome because the avocado’s healthy fats help increase lycopene absorption, making it more available for your body to use. 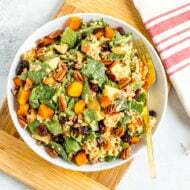 Today’s salad highlights the dynamic duo, but with a few additional toppings thrown in to make it extra special, perfect for the holidays. 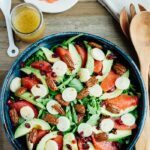 The layered grapefruit and avocado salad looks elegant and festive, but it is really easy to toss together. 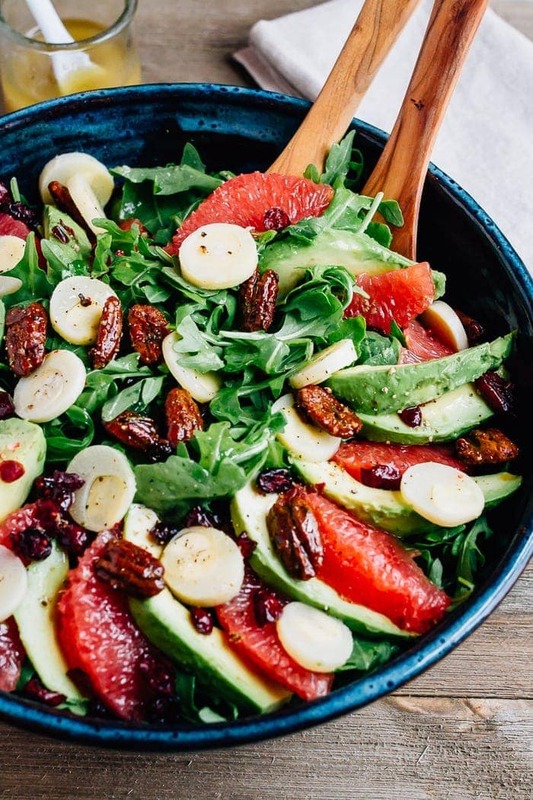 You start with a base of spicy arugula, layer the grapefruit segments and avocado slices, sprinkle on the hearts of palm, dried cranberries, rosemary candied pecans and a sweet maple apple cider vinegar dressing to top everything off! Easy and delicious. 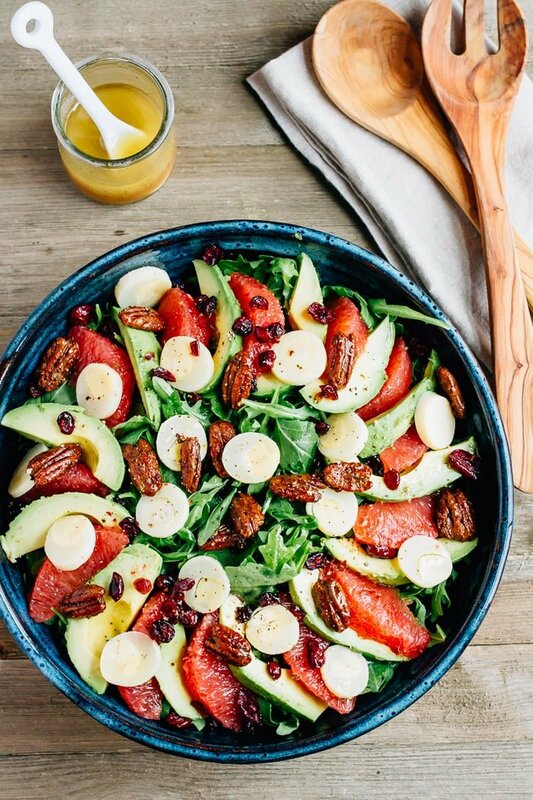 I hope you enjoy this grapefruit avocado salad as much as we do. A festive winter grapefruit avocado salad with peppery arugula, hearts of palm, candied pecans, dried cranberries and a maple apple cider vinegar dressing. 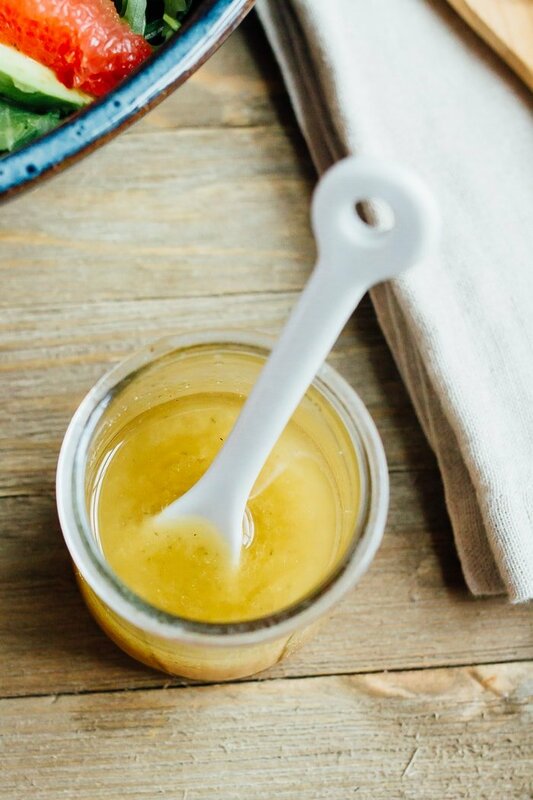 Make dressing: Add apple cider vinegar, maple syrup, dijon mustard, sea salt and pepper to a small bowl. Slowly whisk in oil until the dressing is emulsified. Set aside. Segment grapefruit and slice avocado. When ready to serve, place arugula in a large bowl. Layer the avocado and grapefruit segments along the edge of the bowl, top with hearts of palm, candied pecans and cranberries. To serve, drizzle dressing over salad and plate. Wow, this looks amazing! 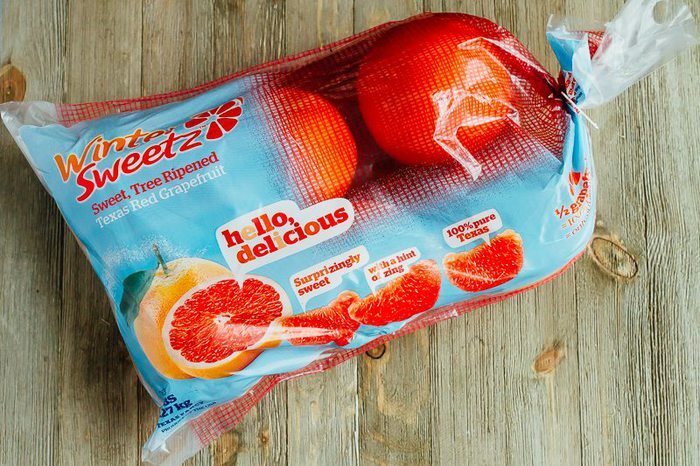 I love grapefruit, and this reminded me I need to pick up a bag asap. Your arrangement of the ingredients in perfect! Oh this just looks absolutely gorgeous ! Gorgeous photos I love grapefruit! I will be trying this. Thank you Karlie! I hope you love the salad. I am drooling! Grapefruit is my FAVORITE!! Can not wait to make this salad! 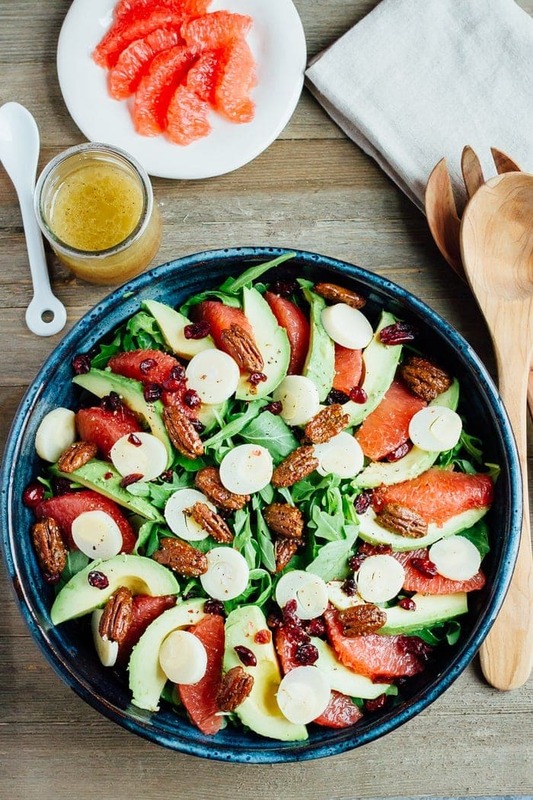 Grapefruit and avocados are such an amazing combo! Can’t wait to make this! What a delicious and healthy salad! Good tip on picking grapefruits. 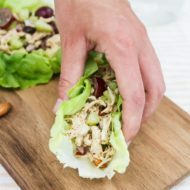 Coincident that I’m seeing hearts of palm today – last night I was watching Chopped and they used hearts of palm in their recipe 🙂 This looks FANTASTIC! !